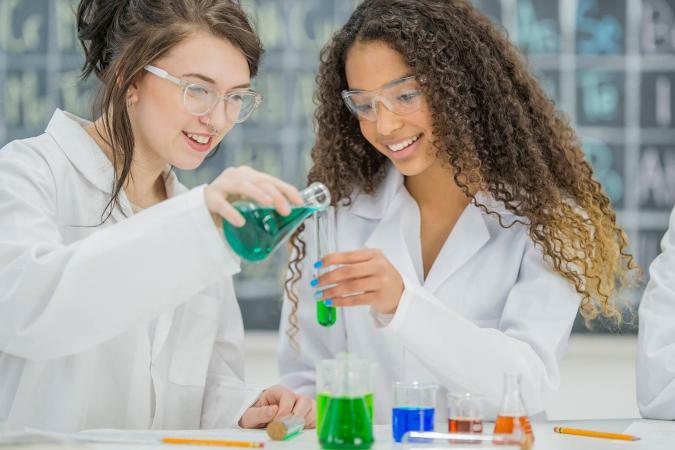 Chemistry games for kids can make science fun, and it can create a learning environment where kids retain what they've learned and understand how to apply it. Learning can happen anywhere at anytime, so be open to different ways to apply chemistry concepts to the world around you. Ignite your students' interest in chemistry by requiring active participation. These games are all 'open-and-go' and require little prep. To get the printables to display properly, make sure you have the latest version of Adobe Acrobat reader. This game is good to use before a big test, such as a midterm or final. There are some sample questions in the printable to the right, or you can use questions from your own study guide to play this game. Toy Basketball and Goal - Alternatively, you could use round, foam bals and a laundry basket. Place the basketball goal in an open space in the classroom. Use a piece of bright blue or green painter's tape to mark where you want the students to stand while attempting to score baskets. Print out the list of questions and answers. Divide the class into teams of five or six students. Choose a captain for each team, or let the student groups choose captains. Have each team line up facing the basketball goal. The captain should be in front and the team mates lined up behind the captain. Start with the team on your right. Ask the captain one of the questions on your paper. It is best to go in order in case the teams accuse you of playing favorites. You can just tell them you are reading the questions in the order you have them. It also helps avoid confusion about which questions you've already asked. If the captain gets the question correct, the team gets one point. He also gets to throw the foam basketball into the hoop. If he makes the basket, the team gets another point. If the first person gets the answer correct, the team keeps playing, with each new player stepping forward and the person who last played going to the back of his team's line. The same team plays until someone misses a question and then the questions move to the next team to the left. Ask questions until the allotted time is up. The team with the most points wins. This game works well with questions that might have more than one answer, such as naming certain types of periodic elements or things needed to conduct an experiment, etc. 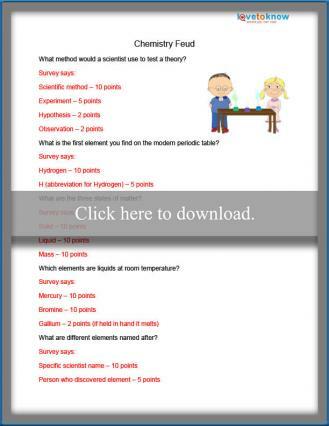 For a list of sample questions, click on the printable to the right. You can also use questions from your tests and study guides. Place the bell and the list of questions and answers by your side. Ask Team # 1 the first question, and allow them to consult with one another and come up with an answer. You may want to set a time limit on this, such as one minute per team to come up with the answer. The team gives the answer they've chosen. If their answer matches one of the correct answers, ring the bell and tell them how many points the team just racked up. The game ends when the class period is up or allotted time is over. The team with the most points wins the game. Learning the abbreviations to the periodic table is one of the biggest challenges in Chemistry. This game helps students learn what the different symbols for different elements are and can serve as a great way to review basic Chemistry. Cut apart the cards with the abbreviations for the periodic table. Move the desks and chairs to one end of the room and out of the way so you have an open space or get permission to use the school gymnasium or other empty room. Start by going over some basic rules. No pushing, tripping or hurting another person to get a card. Have each team line up on one end of the room from right to left, with one person from the team at the front of a line and the rest standing behind that person. You will call out an element and the person at the front of the line from each team should find the card with the correct abbreviation. The first person to find the correct card gets a point. However, if the person chooses the wrong abbreviation, the team loses a point. You can also play this game in reverse where you call out the abbreviation and the students must find the corresponding element name. Team with the most points wins. Ever have 5 or 10 minutes at the end of class and need something to do? These simple games use everyday items and can help turn what would've been wasted time into productive time spent reviewing key concepts. A simple way to review a study guide or information for a quiz or test is to use an idea from a classic indoor party game like musical chairs. Set classroom chairs up in a circle and turn on some music. There should be one less chair than the number of students playing. The students walk in a circle until the music stops and then scramble for a chair. The person left standing must answer a chemistry question. If she gets the answer correct, she continues to play, but if she misses the questions, she is out of the game until a new game starts. Each time a student is "out," a chair should be taken away, so there is always one less chair than the number of students playing. Last student playing wins the game. Find any old board game that has a start and a finish line, or make one of your own with a small piece of poster board. Game pieces can be anything from small novelty erasers to buttons. You'll also need a pair of dice. When it is his turn, have the student roll the dice. He then answers a question of your choosing. If the answer is correct, he moves forward the number of spaces on the dice, but if it is incorrect, he stays put. If he answers two or more questions in a row wrong, he starts moving backward on the game board. First person to the end of the game board is the winner. Turn a simple science experiment into a competition. Make foaming dough out of baking soda and liquid dish soap. Make the dough ahead of time, and pass out heavy duty disposable plates. Instruct students to create a double helix looking form out of the dough. Students can each create their sculpture at a desk. Once the sculptures are completed, have several students at a time come to the front of the classroom and hand them small disposable drinking cups filled with vinegar. Have the students pour the vinegar over their double helix. The one that melts the best, wins. Continue until there are only a few finalists left and then have the class vote for a winner. Alternately, have kids build volcanoes and have lava races to see whose volcano spews the fastest. Let the kids try different measurements and combinations to see which concentrations work the fastest. Record results after each race. It might be a good idea to do this activity outside as it can get messy! Another great way to get children involved in chemistry is to allow them to play games online. There are many different types of sites and types of games to interest even the most reluctant learners. Elements Games - If your student is struggling to identify the elements, the games on this site can help. You'll find an element matching game that matches up the element to the group it belongs to and an interactive periodic table that identifies the elements as your child clicks on each one. 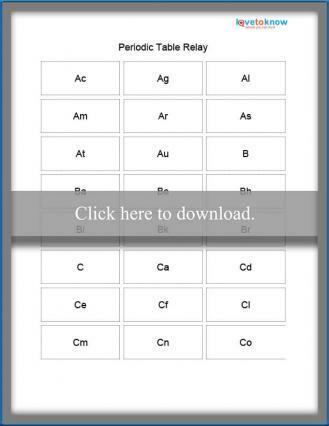 ChemBalancer - This game will help your student learn how to balance chemical equations. 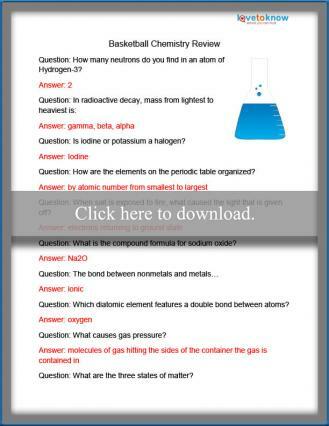 Click on the directions button for a simple explanations about how to balance chemical equations. Then, start the game and see if you can balance the equations for different elements. If you're correct, you'll get to move on, but if you're not, you'll have to try again. Neopets Chemistry for Beginners - To learn some of the basics of chemistry, play Chemistry for Beginners. There are two levels of difficulty. You'll start with topics like synthesis. The graphics and interactive model of this game make it fun for students, so they'll want to play it often and it won't even feel like studying. Star Chemistry - Set the game to easy, medium or hard. Use different movie star elements to build a molecule. Each star is presented with a sketch of their face and there is an element tagged onto the graphic, such as Br or lc. Combine the stars (pay attention to the abbreviations they are tagged with) and build a molecule. Your student will also learn some movie trivia while playing. When learning is fun, kids are excited about new material. Try to look for ways to pull in science information in every day activities. Visit local science museums, and encourage your child to ask questions about every day processes to learn about different types of science. For example, why does water boil slower when salt is added to it? Why do Tums dissolve in vinegar? Find ways to make science fun, and your child will become curious and start to learn on his own.